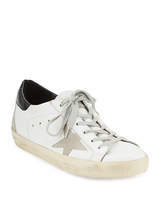 Details Golden Goose distressed leather sneaker. 1" flat heel. Round toe. Lace-up front. Star detail at side. Logo patch at tongue. Rubber outsole. Made in Italy. 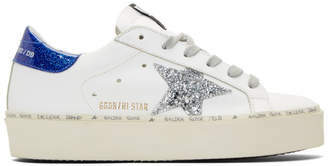 Designer About Golden Goose: Venice-based husband and wife Alessandro Gallo and Francesca Rinaldo launched Golden Goose Deluxe Brand with ready-to-wear in 2000. 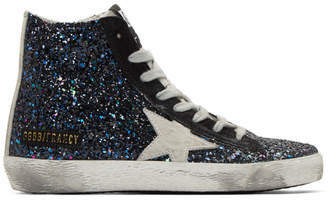 Unique in their synthesis of West Coast nonchalance and Italian craftsmanship, the duo added sneakers seven years later. The retro silhouettes for men and women are meticulously crafted from Italian leather and distressed by hand. Heel height may vary by size.